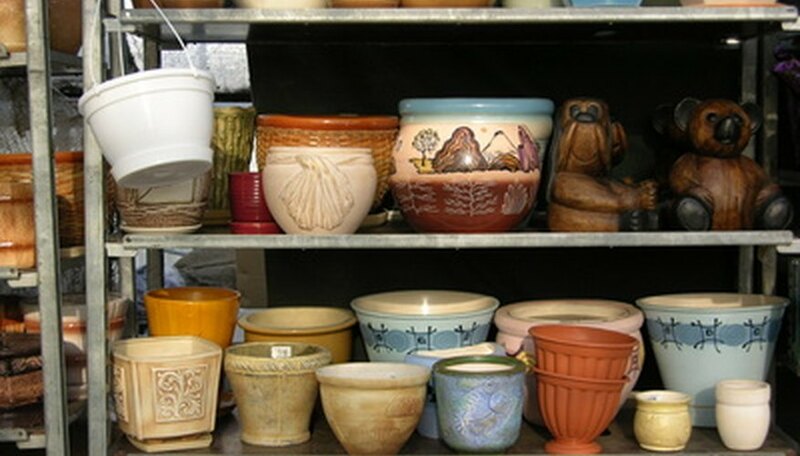 Flower pots come in an assortment of shapes, sizes and styles. They range from simple terracotta containers to lavishly painted porcelain vessels, and may be as petite as a strawberry or as large as a sandbox. No matter how austere or embellished they may be, flower pots are often as aesthetically pleasing as they are functional. Their physical beauty and varied structures make them interesting subjects for drawing. Obtain an assortment of flower pots to draw. Choose flower pots in shapes and styles that appeal to your taste. You can also use images of flower pots from gardening catalogs, book, magazines and websites as models for your drawings. Position a flower pot or image of a flower pot in a place that you can see easily, such as on a tabletop or desk. Find a comfortable drawing position for yourself. Consider sitting at a desk or table, using a lap desk or board, or simply resting a pad of drawing paper on your knees. Remember that your body will let you know what drawing position works best for you; if you are tense or uncomfortable, make adjustments. Study a flower pot or the image of a flower pot. Take note of its size, shape, dimensions and angles. Focus on creating an accurate outline of the flower pot, not on small details. Draw what you see, using light pencil strokes. Render the circular opening of a basic cylindrical flower pot by drawing a slightly flattened, horizontally-oriented circle shape. Draw the sides of the flower pot by bringing lines downward from the flattened circle. Create the base of the flower pot by connecting the lines of its sides with a slightly concave horizontal line. Look up from your paper frequently to verify the similarity between what you draw and what you see. Consider smaller details of the flower pot or image of the flower pot. Note the texture of its surface, as well as any embellishments or designs. Replicate these smaller details in your drawing. For example, if the flower pot features a braid motif all the way around its exterior, replicate the braid. Because the embellishments and designs on the cylindrical flower pot exist on a curved surface, you should capture this curve in your drawing, rather than draw them in a straight horizontal line. Continue to shift your gaze back and forth between your drawing and your model as you work. Note whether any shadows are on or near the flower pot. Add these shadows to your drawing using light strokes with the soft side of your pencil’s tip. For example, if the flower pot casts a shadow on the desk or table on which it is positioned, replicate that shadow; it may extend from the base of the flower pot outward. If light is hitting the flower pot in such a way as to create a shadow on the surface of the pot, replicate it, making sure to capture its natural curve. Blur shadows with a cotton ball or cotton swab; avoid using your fingertip. After you have practiced drawing several flower pots by studying models of them, try drawing flower pots that you see in your imagination. You may render flower pots more appealing than any you have ever seen in the real world. You can also use your drawings of original flower pots as inspiration if you are a sculptor, potter, woodworker, metalsmith or other craftsperson. Using a pad of drawing paper, rather than loose sheets, can be helpful; the pad can serve as a support for the top sheet of paper on which you are drawing, eliminating the need for a desk or table. Stay relaxed while you draw. Tension can adversely affect your drawing. Take deep breaths, and stop frequently to rest and study your flower pot model. Avoid resting your hand on your drawing paper while you work. Even clean hands can leave blemishes on paper. Never use a hard eraser on your drawing. Hard erasers can ruin the surface of the paper. If you must erase, use a soft, gum eraser or a tacky eraser that will gently lift the pencil off the paper.